Pictured L-R: Mike Metheny, Joelle Beusterien, Quinn Mosier, Russ Berlin. 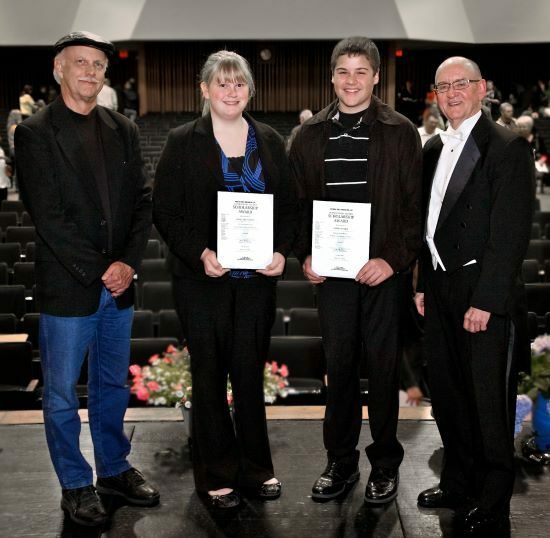 As part of the May 14 concert by the Lee’s Summit Symphony at the Bernard C. Campbell Performing Arts Center in Lee’s Summit, MO, the Metheny Music Foundation’s annual summer music studies scholarships were awarded by the Symphony’s music director, Russell E. Berlin and Foundation board member and chairman, Mike Metheny. Mr. Berlin is also a Metheny Music Foundation board member and serves on its Scholarship Committee. Joelle Beusterien, a clarinetist from Lee’s Summit West High School who will be attending the Midwestern Music Academy at the University of Kansas in June. Quinn Mosier, a pianist and composer from Summit Lakes Middle School who will be attending the University of Missouri/Kansas City Music Composition Camp, also in June. The Metheny Music Foundation began in 2007 and is based in Lee’s Summit, MO, the hometown of trumpeter Mike Metheny and his brother Pat, a Grammy-winning guitarist who is also a member of the Metheny Music Foundation board. Over the past five years those choices have included camps at the University of Missouri (Kansas City and Columbia), the University of Kansas (Lawrence), the University of Central Missouri (Warrensburg), Northwest Missouri State University (Maryville), the University of Arkansas (Fayetteville), the Blue Lake Fine Arts Camp (Michigan), and the Berklee College of Music (Boston).